eobiont - Communicating a complex range of advertising possibilities in one clear poster. Communicating a complex range of advertising possibilities in one clear poster. eobiont created a series of Berlin subway advertising posters that communicate DIE DRAUSSENWERBER’s complicated range of offerings through only the use of images. DIE DRAUSSENWERBER provides outdoor advertising throughout Berlin. Covering nearly every corner of the city—from bridge overhangs to U-Bahn station staircases— their seemingly endless array of unique advertising spaces have the possibility of serving both large and small businesses. They wanted to be able to quickly and clearly convey their offerings using their own advertising spaces as the medium. 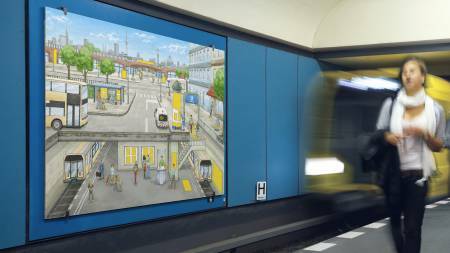 To best show the wide range of possibilities available, we created an illustrated poster of a typical Berlin cityscape, filled with people and activity, that literally highlights all of their advertising products in bright yellow. In this way, commuters and passersby who come across the poster can easily understand DIE DRAUSSENWERBER’s offerings in a matter of seconds. 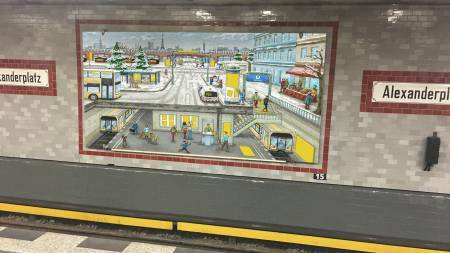 DIE DRAUSSENWERBER has used this cityscape motif in various forms since 2009, and the poster can still be seen gracing subway platforms all around the city. It remains very effective at promoting their brand recognition and at the same time communicating their offerings. It has become one of the most recognized and well-liked advertisements in Berlin.